If you are looking for a stylish, clean, and contemporary cat tree then the Lifestyle Cat Tree should be on your WishList! Unlike other models on the market which have all of the bells and whistles that can sometimes look cluttered. The Lifestyle Cat Tree brings it back to the basics with its simple, elegant and practical design. At 115 cm tall, the Lifestyle Cat Tree provide your feline friend with more than enough heights for them to feel safe and secure and keep an eye on everything that is going on around them. Both of the platforms are connected via two high-quality, sisal covered, scratching trees that your feline friend will love to climb and dig their claws into. On average, cats are asleep between 12 and 16 hours a day so it is important that they have a nice cosy getaway to shut their eyes and have a relaxing catnap. Fortunately, the Lifestyle Cat Tree has a ground level bungalow with two separate Heidi-Holes but they can escape to and relax in privacy. Included inside is a plush, machine washable pillow that your feline friends can snuggle up to as they wish. 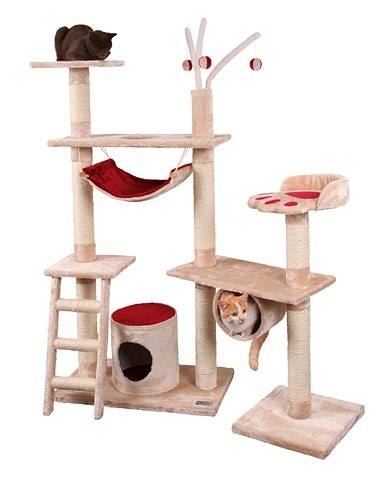 If style and simplicity is your thing, then the Lifestyle Cat Tree is the one for you! A unique design which stood out for me. Product arrived well packaged within 5 days and very easy to put together. Previously bought the Gingerbread cat tree, but decided to try this one out and purchase something a bit different. I have two very happy cats and love the simple and sleek design.